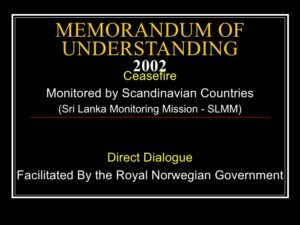 On 22 February 2002 the then Prime Minister Ranil Wickremasinghe & LTTE facilitated by the Norwegian Government signed what is known as the Cease Fire Agreement (CFA) thereafter on 18 March 2002 the Norwegian Government & the GOSL signed a status of mission agreement to establish the Sri Lanka Monitoring Mission to which both GOSL & LTTE gave written consent. The Ceasefire Agreement was formally abrogated in January 2008. The SLMM was tasked to monitor the implementation of the CFA through on-site monitoring. SLMM comprised members of Nordic countries & given diplomatic status under Vienna Convention (immunity from personal arrest or detention & legal process including words spoken or written by them). By March 2002, 23 monitors from Finland, Norway, Denmark, Iceland and Sweden were deployed to SLMM HQ in Colombo. SLMM had District Offices in Jaffna, Mannar, Vavonyia, Trincomalee, Batticaloa and Apmara with one SLMM Liaison Team deployed in LTTE HQ in Kilinochchi. Each SLMM District Office had a Local Monitoring Committee, consisting of five members; 2 from LTTE, 2 from GOSL and SLMM member functioned as the chairman. Another example of a sovereign nation being placed on par with an internationally banned terrorist movement. The SLMM had freedom of movement including travelling in GOSL vessels & aircrafts. SLMM were permitted to import operational supplies & equipment free of import taxes & duties. SLMM could reimburse for VAT/Goods & Services Tax on locally procured operational & equipment & were to also enjoy privileges for taxes on petrol. SLMM were also permitted to use all kinds of communication systems even satellite communications. They were also given the right to use codes & receive correspondence in sealed bags/courier. GOSL could not detain any communication directed to the SLMM. The GOSL even agreed to facilitate smooth custom clearance of SLMM’s operational supplies. SLMM was even ready to facilitate LTTE requests to be given access to Jaffna islands for ‘political work’ and allowing LTTE to move in their own vessels from North to East to ‘visit their families’. Perhaps everyone has forgotten how LTTE held 2 SLMM officials against their will in July 2002 and physically hindered from leaving the LTTE trawler. Between February 2002 and April 2007 LTTE had committed 3830 violations of the CFA against 351 by the GOSL. Why have these figures not been used in Geneva against the LTTE? • 3 abduction of military personnel – WHERE ARE THEY NOW? • 30 cases of extortion – HOW MUCH? LTTE had even obstructed SLMM 14 times from 2002 February to December 2004. SLMM are also accused of indirectly assisting the LTTE. Wikileaks cable release gives news of a confidential cable sent by US envoy on 23 October 2003 by Charge d’Affaires James F. Entwistle who disclosed that the SLMM had admitted helping LTTE evade apprehension. The then President Chandrika Kumaratunga even accused the SLMM of deliberately tipping off the LTTE in a letter she sent to Norway. Noteworthy is that the UNP did not support the President & instead demanded her not to change Teleffsen in case it would upset the peace! The appeasement policy that the UNP adopts to this day. However, SLMM’s chief Tryggve Teleffsen was asked to leave. There is little doubt that the SLMM & LTTE had an understanding special to that which SLMM did not have with the Sri Lankan Armed Forces. The SLMM issued a statement that 4000 persons had been killed since Mahinda Rajapakse became President in November 2005. There is nothing to be surprised about the evidence-less figures that keep popping out of the sky on the guestimated number of deaths – ignoring classifying how many of the supposed dead were LTTE cadres, were civilians, how many were killed by LTTE, Armed forces or died naturally – all are being credited to the army only. The SLMM wanted to imply that the new government was responsible for the killings. SLMM did not classify how many of the supposedly ‘killed’ were civilians or LTTE. Naturally the world was elated at the numbers charged against the Rajapakse government. When pressed the SLMM refused to even divulge the sources or showcase proof and the Rajapakse government did not take the SLMM to task for promoting unsubstantiated claims and the co-chairs US, EU, Norway and Japan also chose to stay silent as did the Secretariat for Coordinating the Peace Process (SCOPP) inspite of the army challenging the figures. It was identical to the drama unfolding about the supposed 40,000 dead! The GOSL also chose not to severely challenge these numbers. Little said of the CFA is better – no one, not even the armed forces heads were shown a word in it before it was signed. For the first time a national army was put in par with a terrorist group, territory was officially given to these terrorists – CFA lines were almost LTTE borders, terrorists were allowed to travel to any part of the country armed while the national army were confined to barracks. By allowing a terrorist group to rule ‘air’ ‘sea’ & ‘land’ the Ranil Wickremasinghe government had virtually ceded Sri Lanka’s sovereignty. LTTE set up their own police, own banks, own courts, own administrative systems, tiger tax system, own checkpoints – there were 17 such check points after the 2002 CFA. LTTE were even arresting Sri Lanka Police that entered into ‘their’ area. The high security zones created by the army were all reduced or eliminated. It was during this period that a horrific betrayal took place with the incident of the Millennium City debacle resulting in the exposure of the intelligence operatives & LTTE killing 44 such brave anti-LTTE informants & officers. Most of the killings during the CFA were of people who were anti-LTTE. https://www.hrw.org/legacy/backgrounder/asia/srilanka080603.htm It was in August 2005 that the LTTE assassinated Sri Lanka’s Foreign Minister Lakshman Kadiragamar. It was also before the CFA that the tiger proxy TNA was created in 2001 immediately after 9/11 & the war on terror – obviously the foreign think tanks were quick to establish a political proxy lest LTTE were pushed against the wall. It was also during the CFA that Karuna split from the LTTE and it has become fashionable to pass all credit for child soldier recruitment to Karuna instead of the LTTE. Thankfully Prabakaran did not declare UDI, had that happened the West would have jumped to recognize Eelam. The most hilarious news was the GOSL issuing passports for these terrorists to travel to Ireland for 3 month training! The GOSL even allowed LTTE to bring in sophisticated hi-tech communication systems and duty & taxes were paid by the Ranil Wickremasinghe Government signed by Austin Fernando then Defense Secretary and even transported complimentary to LTTE areas. SLMM helped Sea Tiger Soosai travel to Singapore helicoptered to the airport courtesy Ranil Wickremasinghe government. While Colombo UNPers were boasting of a well-won ‘peace’ by their leader Ranil, the LTTE were busy setting up LTTE camps with across the North & East, replenishing their weapons & storing more weapons & ammunition. Ranil Wickremasinghe’s government orders to the army were ‘do not retaliate’ and even when LTTErs showed their backsides to the army or spat at them, the army had to simply watch their ugly backs! Isn’t this same humiliation not getting repeated now? The similarities are too shocking of both periods that Ranil ruled & the manner the armed forces & police are suffering humiliation & ridicule. Another noteworthy aspect of the CFA was the prohibition of arrests under PTA and instead Criminal Procedure Code was adopted. Is it a surprise that the same parties are working to abolish the PTA though Armed Forces personnel are presently being arrested under PTA. Wherever have you heard of military personnel getting arrested as terrorists! What needs to be said & clearly understood is that the CFA provided the window of opportunity for LTTE to regroup, re-enlist adults & children, restock and prepare for a bigger battle. The presence of the SLMM clearly established the futility of international presence & monitoring of a conflict. The SLMM presence was clearly a proven failure by virtue of its own status report. The continued calls for foreign presence to monitor the situation proved futile. SLMM could not even stop the death of a very distinguished person like Lakshman Kadiragamar, Sri Lanka’s Foreign Minister. Moreover, apart from simply documenting what the SLMM thought fit to document, SLMM did nothing to stop LTTE killings, in fact LTTE only grew throughout the CFA, a factor many living in Colombo have failed to understand & admit. LTTE strengthened itself during the CFA as it freely moved not only throughout the country but overseas as well. LTTE was able to select & purchase a range of sophisticated weaponry far superior to that which the National Army had. It was able to establish links & contacts for military purchases & other technical requirements & these ‘freedoms’ afforded to by LTTE even under the watchful presence of the SLMM ended up with LTTE returning to their murderous ways with greater intent & fury …. Kebethigollawa bus deaths, LTTE air attack on Colombo & airport were just a handful of attacks carried out by the LTTE after the ceasefire ended. The ceasefire was only in name and the over 3000 violations by LTTE suffices to prove this. Those who continue to say foreign presence, foreign truce monitors, foreign judges, foreign this – foreign that is needed to solve Sri Lanka’s problem need to only take the record sheet of the SLMM to realize with what bias they had conducted themselves & their inability or their lack of desire to prevent LTTE terrorizing the people of Sri Lanka. CFA was the worst thing happened during 30 years of war. Norwegians are still active de stabilizing Sr Lanka. LTTE has very healthy war chest. They are busy collecting money in Europe and America. Present government is a blessing for them. Now there are some anti LTTE patriots trying to change the atmosphere of falsehood against the Sri Lanka Armed Forces created by pro Terrorist Tamils and Local NGOs, it would be proper that Shenali’s article is issued as a pamphlet of information amoung the delegates to the UNHRCouncil Sessions. This entry was posted on Tuesday, September 25th, 2018. You can follow any responses to this entry through the RSS 2.0 feed. You can skip to the end and leave a response.